These are my favorite towels! They dry quickly, look beautiful and make me feel like I'm at a high end spa when I use them. Can't recommend them enough!! This ultra-soft and extremely absorbent Authentic Pestamal Fouta towel wrap is made from 100-percent natural Turkish cotton hand-woven on ancient looms in Turkey. The herringbone weave Fouta towel is lightweight and generously sized. 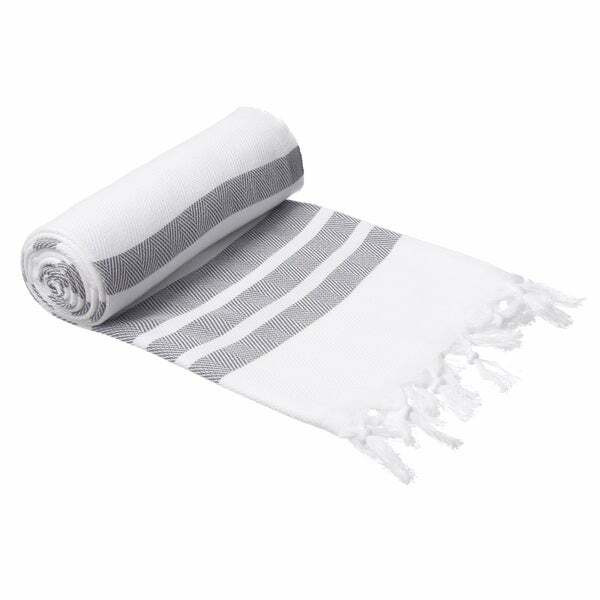 I purchased this towel for a friend, hoping it would be the same quality as the two Authentic Pestemal Fouta True Blue Turkish Cotton Beach Towels Item#: 15137505 (also overstock items), that I had recently bought for myself. NOT TRUE. The quality isn't near as good. The edges roll and wrinkle whereas the mine do not. It also isn't as soft. I still haven't given it away and don't know if I will. Hard for me to say...I love my Fouta towels, yours isn't as nice though....sorry!!! This is my favorite purchase from overstock this season ! These towels are so lightweight yet absorbent and the style is over the top and blends well with any decor Compliments galore from guests! Plan to order more ! Thanks ! Great size...soft to the touch...very light and absorbs perfect.